⇒Promote your book by listing it on ADAA's publications website page for consumers and on ADAA's member publications page. Post your clinical trials, support groups, and job and fellowship openings. ⇒Reach ADAA's public community by listing your practice on ADAA’s Find-A-Therapist platform. Engage with our more than 36 million consumers by sharing your expertise through hosting webinars or writing blog posts. All ADAA members cited in the media are highlighted on the ADAA website, in ADAA's monthly public newsletter, and in ADAA's bi-weekly professional newsletter. ⇒Subscribe to ADAA's online journal - Depression and Anxiety. Readership consists of healthcare providers concerned with the etiology, pathophysiology, epidemiology, nosology, symptomatology, and treatment of anxiety and mood disorders (including bipolar disorders, major depression, and dysthymia). Reach a targeted audience of dedicated professionals by submitting a research article. Attain high visibility as ADAA's Depression & Anxiety is available online through Wiley Online Library® , Wiley’s Internet publishing platform. Wiley Online Library® has more than 29 million user sessions per year. ⇒Gain exclusive access to ADAA's educational projects and resources, such as the Pediatrician Outreach Project. ⇒Connect & Network with other professionals in the ADAA community in our members only online community (share your recent publications or research updates, post job openings, patient referrals, and more),and join a special interest group (SIG) or committee. ⇒Mentor an ADAA early career professional mentor. Share your experience and expertise. Contact Lisa Patterson to learn more. ⇒Save money on live and on-demand recorded webinars, ADAA special publications, client brochures, and receive a significant discount at the ADAA annual conference. Psychotherapesource.com is an online mental health directory linking individuals with mental health professionals. Users can search for psychologists, marriage and family therapists, psychiatrists, licensed mental health counselors and treatment centers utilizing criteria such as location, psychological issues, insurance and more. Listings include evidenced based treatment approaches. Members receive a 15% discount. Log in to your member account for the promo code. TherapyNotes™ is online EHR, practice management, and billing software designed for mental health professionals. TherapyNotes™ has everything you need to manage patient records, schedule appointments, create rich documentation, and bill insurance, right at your fingertips. Our streamlined software is accessible wherever and whenever you need it. ADAA members receive 2 months free (an exclusive offer to ADAA members). Log into your member account for the promo code. ADAA members receive a special 10% discount on all ADAA store purchases! Exclusive ADAA member benefit: How can we inform parents and pediatricians about child anxiety? Why spend hours of your own time trying to create material that effectively and concisely communicates the CBT based services that you offer your clients? Let ADAA do the hard work for you. 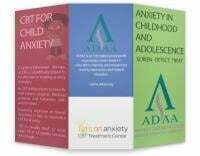 Members can download and access an ADAA Pediatric Outreach PowerPoint presentation and a customizable brochure to help parents and providers learn more about anxiety in children. Both products summarize empirically supported treatment protocols for anxiety and related disorders. These communication tools will assist in facilitating richer working relationships and clinical collaboration with physicians in your community. A general version is available as a free downloadable PDF. Looking to increase visibility of your product or services exclusively to our 1,800+ professional members? Learn how your company can be listed under "Special Offers" as a member benefit by emailing Gabby at goved@adaa.org. "What I've noticed about being a six year member of ADAA is that the more I give to the organization, the more I get back. Several months ago I wrote a consumer blog post for the ADAA website about the fear of vomiting. The article received a huge response which led to me hosting a webinar on the same topic. Since then two people with this fear began treatment with me in my practice." Currently a member? Have a question about your membership? Visit our Member FAQ page for a list of most frequently asked questions or Lisa Patterson, ADAA Membership Director. Are you a new ADAA member? Welcome! Click here to download our new member guide to learn more about member benefits.